Life rarely unfolds as we expect. Illnesses, injuries, and disabilities can impact our ability to participate in our normal daily lives. If you find that your life is turned upside down by an illness or disability, you might think that things will never be the same. And, while some things might change for you and your loved ones, occupational therapy can help you reclaim ownership over your day-to-day life in ways that you thought weren’t possible. If occupational therapy has been recommended for you or a loved one—or if you are simply curious to learn more about how OT might help you or someone you love—this page is your complete introduction to the wonderful world of occupational therapy. Occupational therapy helps people with health challenges re-engage in meaningful daily activities. These daily activities can include anything from bathing independently to cooking a meal for your spouse. Because OTs focus on the whole person, we play a vital role in helping you influence your own health and life in the ways that matter the most to you. We believe that an essential part of healing is being able to participate in the daily activities that you find meaningful. For a child, this might mean playing with friends. For an adult, this might mean being able to fix a meal for your loved ones. We OTs call these meaningful daily routines "activities of daily living." These basic building blocks of daily life can become difficult after an injury, disability, or illness, and occupational therapy professionals help you develop the skills to participate in these activities with confidence. What does occupational therapy treatment entail? An occupational therapist’s work varies from setting to setting, but the treatment process tends to follow a certain flow. OT begins with an evaluation, where your therapist collects information on your history, health status, and any activities that are currently limited. The OT then uses this information to lay out a plan of care that involves specific goals, as well as the treatment techniques he or she will use to achieve those goals. Subsequent treatments focus on some combination of providing physical, emotional, or cognitive interventions to help you achieve your goals. Therapists also consider whether modification of the environment/activity may help set you up for success. Here are some examples of how Medicare (the gold standard in reimbursement) codes different treatments, meaning this is the verbiage you might see on your Medicare bills. When you are discharged from occupational therapy services, it means that you no longer need the skilled oversight of a therapist to continue making progress. However, it does not necessarily mean the road to recovery is over. At discharge, OTs often provide education to you and your caregiver about how you can continue therapy independently. This might involve providing a home exercise program or additional training to family or caregivers. How is occupational therapy different from physical therapy? Occupational therapists and physical therapists are quite similar in some ways, as both are rehabilitation professionals who strive to help patients return to their prior level of function. Both professions evaluate and set treatment plans based on patients’ therapy goals. And both professions believe that recovery means being able to participate in life to your fullest potential. It’s how we go about our work that differentiates the two professions. The key difference is that OT focuses more on the improvement of daily activities while PT focuses more on specific improvement of body movement(s). You can think of a PT like a human body mechanic, and an OT as a guide to the reintegration into normal life. A physical therapist might work with a patient on stair training, with the intention of the patient being able to climb stairs and return home safely––and an OT will consider how the ability to climb stairs safely at home helps the patient with normal daily tasks, such as maintaining a clean home or reaching the upstairs bedrooms. Similarly, a physical therapist might work to improve a patient’s elbow range of motion (ROM) so she can bend her elbow enough to use a steering wheel safely. The occupational therapist will work with the patient to use that range of motion, along with any necessary adaptive equipment, to return to the daily task of driving. Clearly, there is a good amount of crossover between the two, which is probably why we are frequently confused! While we’re on the topic of rehabilitation, many patients benefit from a combination of physical, occupational, and speech therapy. Speech therapists, generally called speech-language pathologists (SLPs), perform evaluations and diagnoses of a variety of speech and language disorders. PT, OT, and SLP professionals frequently collaborate to deliver holistic treatments based on patients’ overarching goals. Depending on your unique needs and goals, you might have PT, OT, or SLP––or any combination of them! What schooling does an occupational therapy practitioner need to practice? 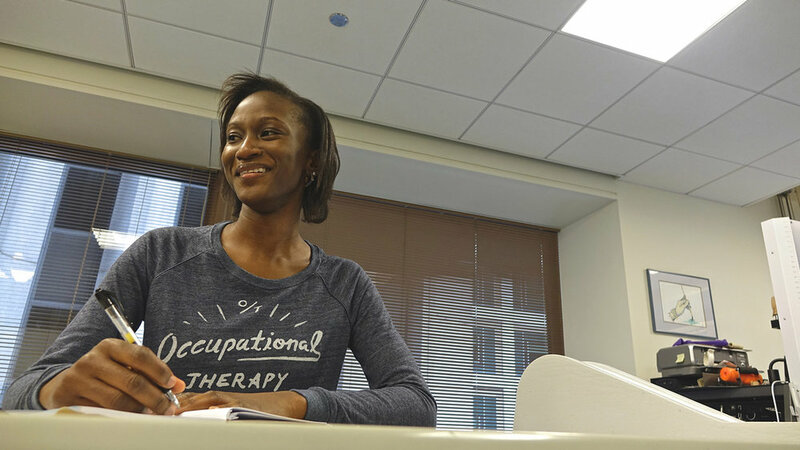 When you’re in occupational therapy, you might receive treatment from both occupational therapists (OTs) and occupational therapy assistants (OTAs). While these professionals both provide skilled treatments, the main difference is that OTs provide evaluations and lay out your treatment plan––as well as delivering treatments––while OTAs solely deliver treatments based on an OT’s treatment plan. The current entry-level degree for an occupational therapist is a Master of Science in occupational therapy. The credentials “MS OT/L or “OT/L” indicate this level of education. If your therapist has the credential “OTR/L” this means she is also registered with our national accrediting agency. This registration is optional. There are also a growing number of programs offering a doctorate in occupational therapy. The credential “OTD” indicates this level of education. Prior to 2007, only a bachelor’s degree was needed to practice as an occupational therapist. Those who obtained their license before this were grandfathered into the licensing. OTAs require an associate’s degree from a certified program. From there, they must pass a national exam before practicing. Read here for a complete overview of their scope of practice. Some OT departments also employ occupational therapy aides. These are non-licensed professionals who do not deliver OT treatments, but do help with daily operations of the department. What specialties are available to occupational therapists? The scope of occupational therapy is very broad, and encompasses many complex issues. For this reason, many practitioners opt to pursue advanced certification in particular areas. A common way of specializing is to earn an additional certification, which is usually denoted by additional letters following the occupational therapy designation. All of these letters can begin to look like an alphabet soup, even to fellow healthcare professionals. The post “Where to Go with an OT Degree” gives you a more in-depth breakdown of the different areas and what it takes to obtain certification. I also have a post called “Your Guide to COTA Certifications and Specialties” that gives an in-depth look at where occupational therapy assistants can go with their own careers. OTs work with people of all ages, addressing physical and mental health in clients ranging in age from newborn to older adult. As you can imagine, this means we work in a number of different settings and locations. You can see that we most commonly work in hospitals, long-term care settings, and schools, but you’ll also see us working in many other capacities. To learn more about each practice area, click on a photo below! In the early 1900s, patients were languishing in hospitals and mental facilities for weeks, months, and sometimes years. We now know that many of the treatments they were undergoing were ineffective. During this time, a movement began among social workers, nurses, and psychiatrists. They believed patients could take their healing into their own hands by engaging in activities versus lying in bed. This appeared to not only speed their recovery, but also prepare them more fully for discharge from the hospital. The official founding of the profession is considered to be March 15, 1917, when the National Society for the Promotion of Occupational Therapy was founded in Clifton Springs, NY. Over the next 100 years, robust science would back up the success occupational therapists had been observing. We are continuing to learn about the science of motivation, neuroplasticity, self-efficacy, sensory integration, etc. Our profession continues to evolve and incorporate cutting-edge science and common sense to provide the best care. OT was founded in 1917 by three women and three men—an equal gender division. This was three years before women had the right to vote in federal elections! George Barton, one of the founding fathers, envisioned the symbol of occupational therapy as the phoenix, a mythical bird that is reborn from its own ashes. Eleanor Clarke Slagle is considered the “mother of OT.” She served in elected offices of the Society for the Promotion of Occupational Therapy from 1917-1937. I also love this quote about our origins from the book "Occupational Therapy: The First 30 Years:"
Patients were not merely diseased organs or tissues to be seen through the lens of a microscope or the image of a radiograph. They were whole persons needing care beyond the acute stage of illness. Furthermore, occupational therapists argued, complex social, economics and biological reasons caused disease, not single microbes. To learn more about OT history check out my blog post, 10 Amazing Moments in OT History. Is OT supported by research? Occupational therapy is a personalized science. We strive to balance tailoring our care to individual needs and preferences with adhering to protocols that have solid evidence behind them. One of the easiest ways to find out about the evidence supporting the occupational therapy resources you are receiving is to ask your occupational therapist. I also have an article called “50 Most Influential OT Research Articles,” which covers the most-cited articles in the medical community that reference OT interventions. To find other clinical resources utilized by OTs, check out the Elevate OT Resource Library. Occupational therapy is a partnership. Your participation is just as important as your therapist’s. Here are some resources for getting the most out of your experience. Where can I learn more about occupational therapy? There are many other countries that have occupational therapy associations, but do not have websites. See a more complete directory at the World Federation of Occupational Therapists website. I hope this has flung the door wide open to the wonderful world of occupational therapy. We are a unique profession filled with compassionate, dedicated men and women who devote their lives to helping you stay as engaged as possible in the activities that mean the most to you.